Time for the first of (hopefully) 52 weekly updates on my progress through the 14 numbered Final Fantasy games. This first post may be a bit longer than the standard, as I figure out how I’ll present these posts going forward. For those unaware, I have been live tweeting my progress in fair detail at my personal account, @zacharyplyons. You can find all my tweets regarding the project by searching for the #RoadtoXVin15 hashtag. You can also contribute to the conversation using that hashtag as well! If you’d rather just catch the highlights, I’ll share a handful of noteable tweets in these weekly summaries. So I started out at the beginning, with Final Fantasy. Instead of emulating the original version of the game, I decided to opt for the updated PlayStation 1 version from 2003’s Final Fantasy Origins. 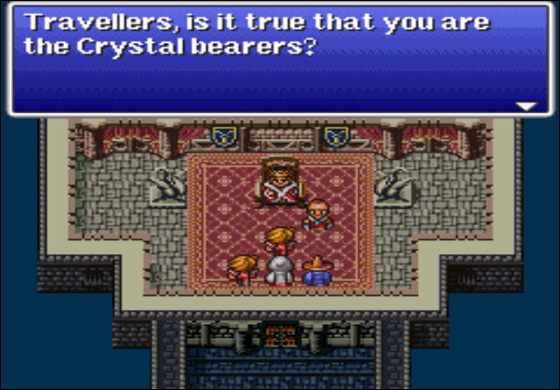 I am currently trying to decide whether or not to play FF2 through Origins as well, or emulate it. Decisions, decisions. Anyway, I have started Final Fantasy, and I feel I’m making solid progress. I definitely don’t think it will take me 24 days to complete it at the rate I’m going, which is a great thing. Any extra time I can get up my sleeve will be extremely helpful for some of those newer, longer games. I’ve taken to tweeting an end-of-day progress snapshot of my menu screen each day, to compare my levels, stats, time, etc. It should be neat to look over that collection of screens at the end of each game. Moving on to actual thoughts on Final Fantasy, it is deceptively deep. While the world seems much smaller when compared to the massive newer worlds of XII or XIII, it still manages to impress in meaningful ways. Not too bad for a game that originally released 28 years ago in 1987 (the same year I was born, incidentally). First off, small details such as NPCs and item descriptions are immensely useful in working out where to go next. I would finish one quest and not quite know where to go, so I’d talk to the townsfolk. Most of them have different things to say, often hinting at problems in need of solving at various locations around the world. Nowadays the majority of NPCs are just there to make the world seem bigger and fleshed out, while barely ever contributing in any meaningful way. Similarly, there have been multiple occasions where I’ve gained a new item, but nobody has told me what it does or where to take it. A quick reading of the item’s description, and oh! Hey! Suddenly, I know exactly what I need to do with that Jolt Tonic! Again, modern games tend to spoon-feed you, and most item descriptions are unnecessary, and the game could easily do without. But for the pros there are plenty of cons as well. Numerous unfortunate mechanics make it glaringly obvious that Final Fantasy is 27 years old. Most notable would be the complete lack of maps in the game. I’m all for a good challenge, but there’s not even a World Map to allow you ease of overseas navigation. On the odd occasion that I’m left searching for my next objective, I found myself circling the edges of the world in my boat, mowing down increasingly pitiful enemies as my levels raised and raised, while passing by all these places I’ve already wrapped up my business with. In this pixelated world, it’s often difficult to recall which squares of water you’ve already sailed before, and which are new and worth exploring. It’s not just the water, either. Oftentimes I have to pass through sections from earlier in the game, where most enemies flee the moment the battle music starts. This rewards me with 1 EXP, and barely any more if I actually get a chance to kill them. This is a game that would benefit greatly from Earthbound‘s system where once you become strong enough, encountering weak enemies immediately results in your victory, obtaining all experience and rewards of the normal battle. These tedious low-level fights would also be easily bypassed with on-land transportation devices, such as cars or chocobos, but it seems Final Fantasy was a bit too early for such things. A few NPCs have mentioned an Airship, however, so I am eagerly waiting to acquire that so I can just fly past all these piddly little guys. So that’s about it for my first week with Final Fantasy. Below I have included a collection of fun and notable tweets from each day, as a kind of summary of my progress. Next week’s round-up should be a bit shorter, now that most of the boring information up top is posted and out of the way. See you next week as the Road to Final Fantasy XV continues!